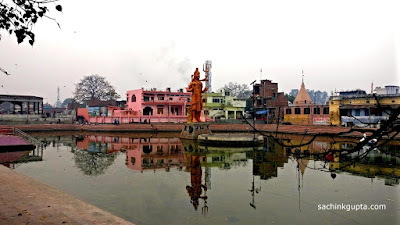 Gola Gokaran Nath Temple is a Hindu temple in Gola Gokarannath, Uttar Pradesh, India and is also known as Shiv Temple of Gola Gokaran Nath. This temple dedicated to Lord Shiva (Shankar). The Gola Gokaran Nath is also called Choti Kashi. This temple is quite anicient, and presently an important and active pilgrimage site of the Hindus and attracts long lines of devotees daily. Teerth-Kund at Shiva Temple is having a new big Shiva idol, which will make its mark in UP and India's tourist places. It was a holy occasion of Pathik's Mundan ceremony (Tonsure ceremony). We left from Shahjahanpur at 10 AM since we had to reach Gola Gokarannath as per plan. We were in a big group of 15 family members to visit Gola Gokarannath temple. Gola is about 65 km from the city of Shahjahanpur, about 35 km from Lakhimpur and about 150 km from Lucknow. As soon as we reached the temple, the echoing sound of ringing bells is simply amazing, and gives goosebumps. People chanting 'Bum Bum Bhole', 'Jai Bhole', 'Om Namah Shivaya' at this place. There are many decorated shops nearby, and small market. It is a beautiful place to conduct religious ritual, though many place need improvement. Anyone can enter the temple premises and its inner chambers. Last visit was with Manish when I visited in 2008. I took some time during evening to capture sunset overlapping with crescent moon on the head of Lord Shiva. Few other photographs were also taken, specially Pathik's mundan ceremony ones. The legend says that when the churning of oceans - Samudra Manthana - took place in the month of Shravan, fourteen different types of rubies came out. Thirteen of these were distributed among the daemons, except Halahal (poison). Lord Shiva drank the Halahal and stored it in his throat. Hence the name Neelkantha (meaning blue throat) is attributed to Shiva. To reduce the strong effect of poison, Lord Shiva wore the crescent moon on his head. All the Gods, thereafter started offering the Ganges water to Lord Shiva to make lessen the effect of poison. Since, this happened in the month of Shravan, since then the Shiva devotees offer the Ganges water in this month. This pilgrimage continues to visit this place throughout the year. It is estimated that during Shravan month, around 10 to 15 lakhs pilgrims visit Gola Gokarnnath dham. Saavan Mela: The importance of Gokarnnath dham increases during the month of Shravan (during July–August every year). During this period, the kanwarias first take a dip in the teerth sarovar (pond) to purify themselves, and then enter into the temple, where the Ganges water is offered to the Jyotirlingam. Chaiti Mela: In the month of Chatra (April) a great fair is organised for one month known as Cheti-Mela. All nearby areas are decorated quite well during that time. Maha Shivratri Mela: During this period, lakhs of devotees throng the Holy Shiv Temple. Bhoot Nath Mela: Shiva devotees offer the Ganges water, flowers, and sweets to the Shiv. Personally I feel that milk offering to the shivaling should be avoided, and can be offered to needy people. I am happy to see that many people understand that, and few temple priest also insist not to offer milk on top of shivaling. We had great time here with Pathik and full family, and everyone felt blessed. Nice pics Sachin Bhaiya n excellent description I have been there too many times but I couldn't remember all the names of nearby temples. all pictures of Gola gokarannath is good. Jai bhole, jai shankar, jai shiv. 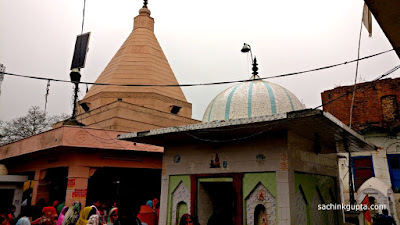 but this description is well explained about Gola Gokaran Nath temple.